Recipe adapted from Moosewood Restaurant New Classics. In a small bowl, using a fork, whisk minced garlic through salt. Set aside. 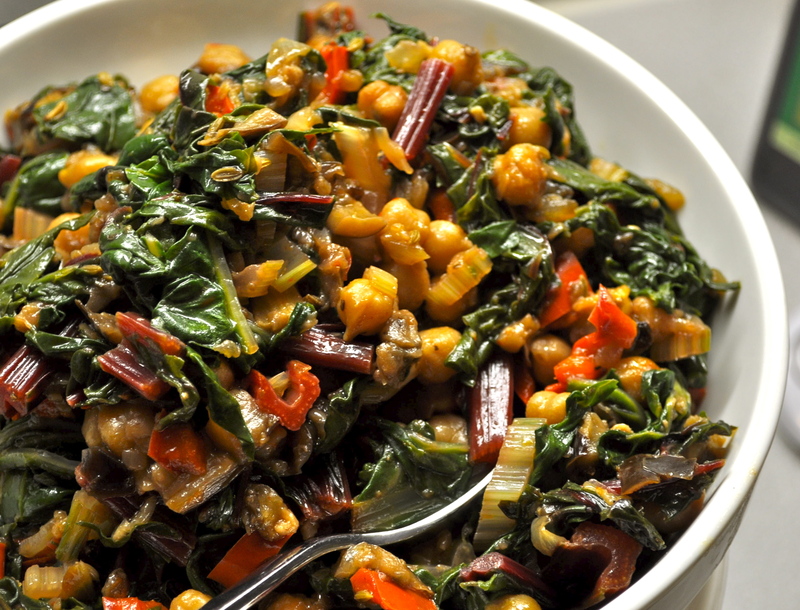 In a large bowl, combine all vegetables, including rinsed and drained chickpeas, and drained canned tomatoes. 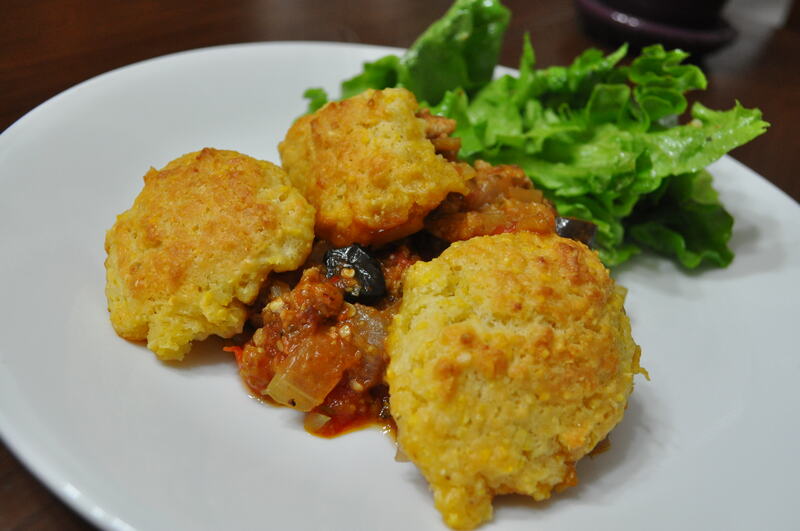 Add spice mixture and mix well until vegetables are evently coated. Spread vegetables on to an unoiled 11X17 inch baking pan. Bake for 20 minutes. 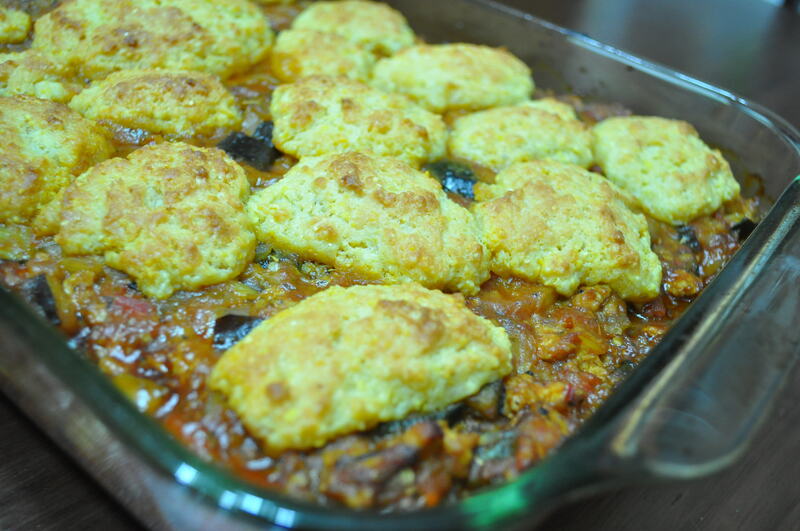 Remove from oven and stir well; then bake for another 20 minutes, until vegetables are tender. Serve with Mint-Cilantro Chutney and Basmati Rice. Put the onion, ginger, garlic and 4 tbsp water in a blender, and blend until smooth. Pour the oil into a large, preferably nonstick, lidded pan and set over medium-high heat. When the oil is hot, put in the potatoes and cauliflower. Fry, stirring until they are lightly browned. Remove with a slotted spoon and set aside. Off the heat, remove all but 3 tbsp of oil from pan, then return the pan to the heat. Add asafetida and then cumin seeds. A few seconds after, add onion mixture from blender. Stir fry for 3-4 minutes. Then add coriander, cumin, turmeric, and cayenne pepper. Stir for a minute, then add tomatoes and cook, continuing to stir for another 2 min. Add cauliflower and potatoes, 1/2 cup water, salt and the chilies. Stir, bring to simmer, cover and cook over very low heat for 15 minutes. Add greens, cook for another 10-15 min. or until cauliflower is tender. After making this delicious recipe, you’ll never go back to using store bought enchilada sauce. This recipe is very forgiving, so try experimenting with a variety of beans and vegetables for the filling (see end of recipe for examples). While enchilada sauce is simmering, coat sliced vegetables in olive oil and sprinkle with a little salt and pepper. Grill on hight heat, flipping once until cooked. Remove from grill and cut into 1/4″ square pieces. (Alternatively: Dice all vegetables. Heat oil in a large nonstick skillet over medium-high heat. Sauté for 5 minutes or until vegetables are tender.) Stir in beans. Made some yummy boxed lunches for my hubbie and me this morning, only to discover that I had an all day meeting with a catered lunch. We’ll see how these sandwiches stand the 24 hour refrigerator test (since I’ll be eating my sandwich for lunch tomorrow). Spread generous amount of hummus on both sides of FROZEN bread slices. Top one side with grilled veggies. 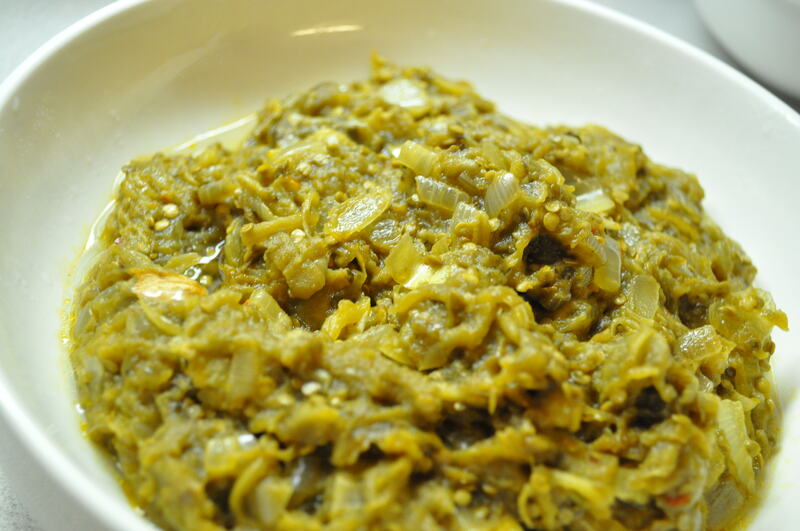 While eggplant is grilling or baking, saute onions and garlic in EVOO until soft (about 5-10 minutes). Meanwhile, rinse and chop swiss chard. Add to pan and cook until wilted. Turn off heat, set aside. 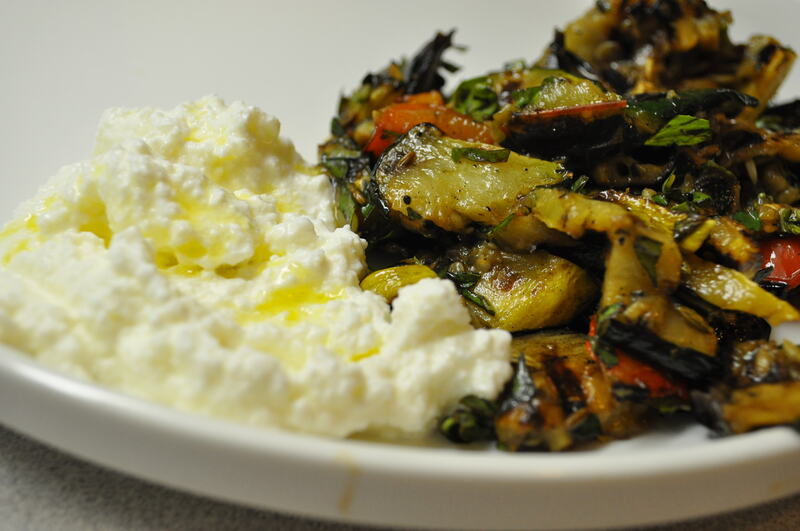 Combine feta through ricotta cheese in a bowl, set aside. Shred mozzarella cheese using salad shooter or food processor. Rinse and drain beans together in a colander. Add sauteed swiss chard to feta mix. Spread 1 cup marinara sauce in the bottom of a 13X9 inch baking dish coated with cooking spray. Arrange 5 eggplant slices over marinara, or enough to cover the marinara with one single layer of eggplant. 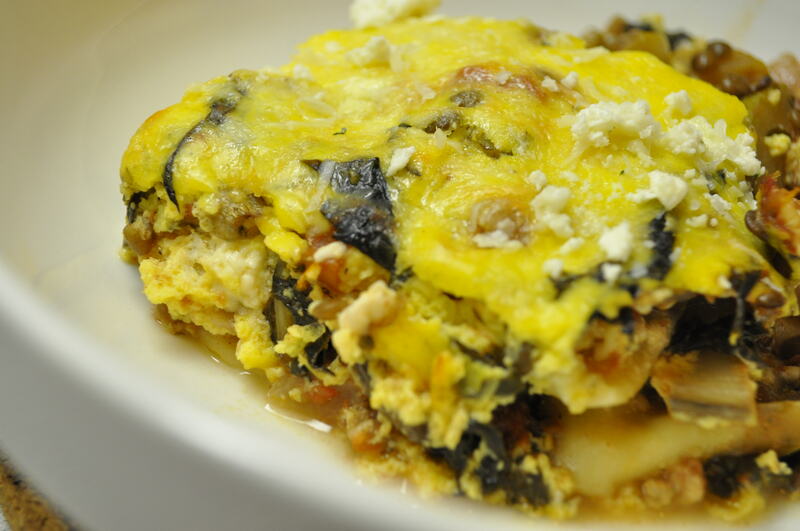 Top with 1 2/3 cups swiss chard/feta mixture, and 1/3 of the beans. Repeat the layers. Cover and bake at 375 for 20 minutes. 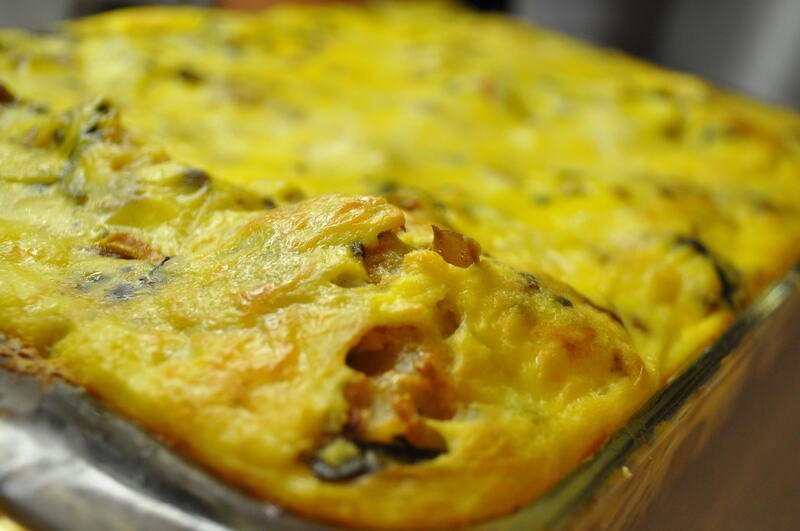 Top with mozzarella cheese and bake an additional 20 minutes or until cheese is browned. Bring water to boil in medium sauce pan with tight fitting lid. Add couscous and raisins. Stir, cover and remove from heat. Let stand for 5-10 minutes. Immediately fluff with a fork and add stir in pine nuts. 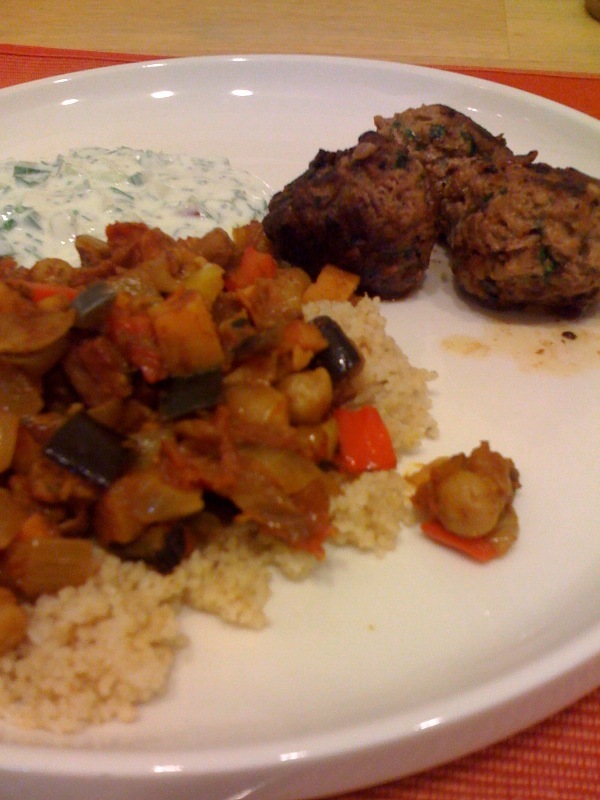 Serve Moussaka and couscous side by side.